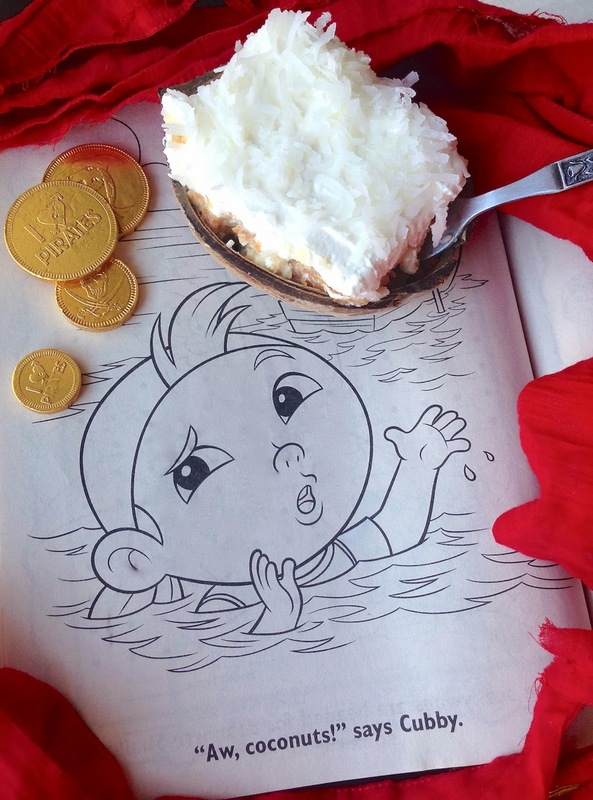 Fiction-Food Café: Coconut Cake for "Jake & the Neverland Pirates"
Coconut Cake for "Jake & the Neverland Pirates"
One of Smalls' favorite shows is Disney's "Jake and the Neverland Pirates". We watch it on Netflix and I've got to say, it's pretty awesome, especially when you get up in season 2 where more characters and environs are introduced and the stories get more involved. There is a trio of main characters who are loyal to Peter Pan while he's off exploring the world beyond Neverland; Jake, Izzy, and Cubby, plus Scully the parrot. The main antagonist of the series is Captain Hook along with his crew of Mr. Smee, Sharky, and Bones. Cubby, who is in charge of the special Neverland map, also loves to cook. 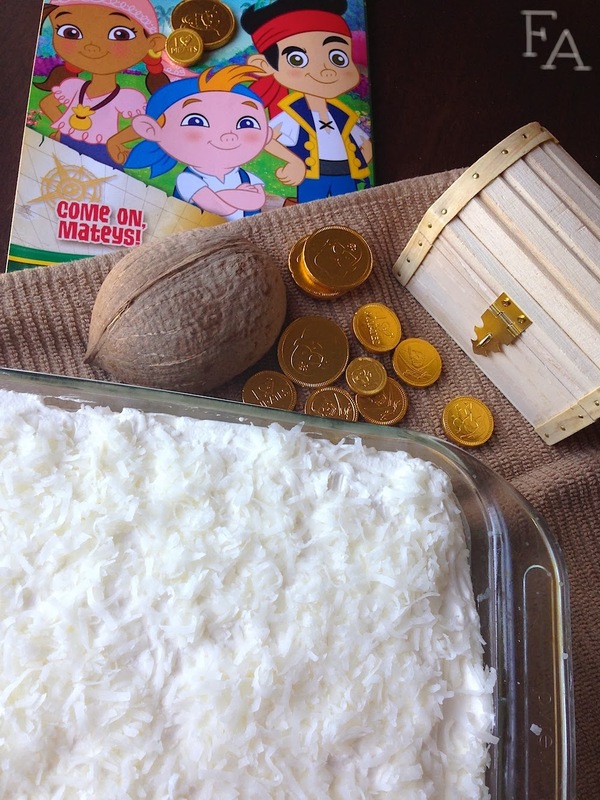 One of his favorite foods is coconuts and I could totally see him making this cake for his friends. He also often uses the word "coconuts" as an expletive. 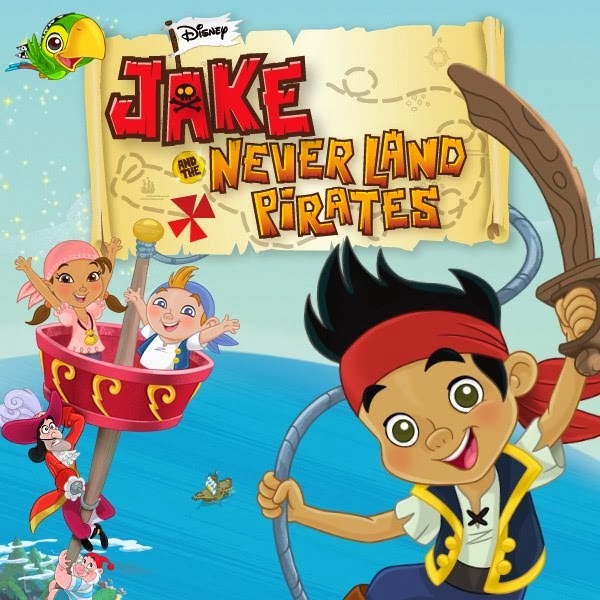 The great music for "Jake and the Neverland Pirates" is by Loren Hoskins and Kevin Hendrickson. Note: This cake recipe is from my awesome friend Nicole (you may remember her as the originator of the base recipe for Finn's meatloaf). 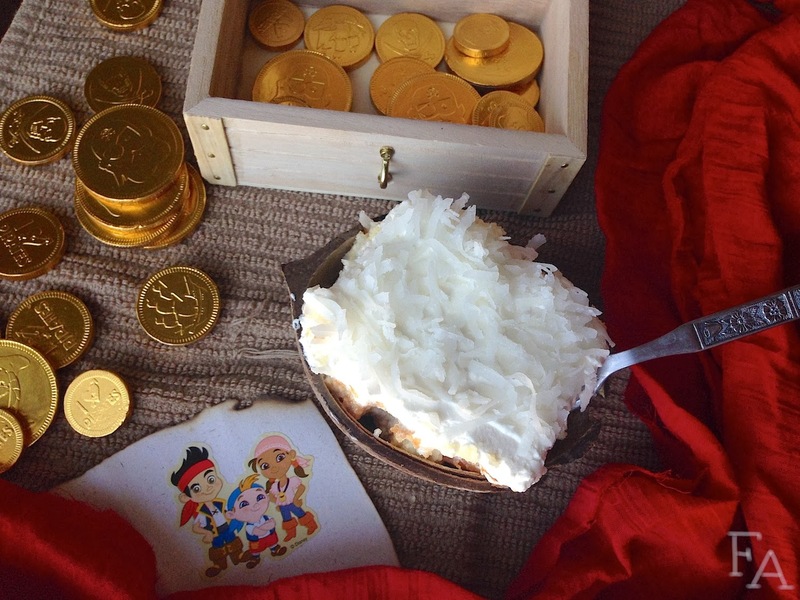 It's easy peasy and super rich and perfect for any pirate gathering. Smalls has declared it her favorite. 1. Prepare the white cake mix as directed on the package & bake it in a 9x13" pan (you could also do cupcakes w/ liners, but they'll be a little messy). Once it's finished baking & still hot, poke the cake all over, really well, with a fork. In a medium bowl whisk together the coconut milk & condensed milk & then pour the mixture evenly over the still hot, fork-poked cake. 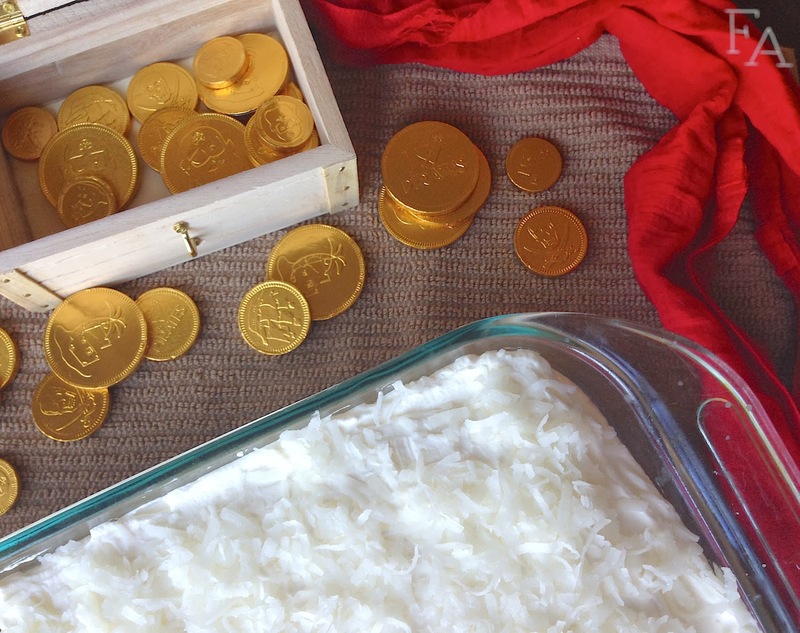 Set the cake aside to cool completely (once it's only a little warm you can cover it with plastic wrap & put it in the fridge to cool the rest of the way). 2. 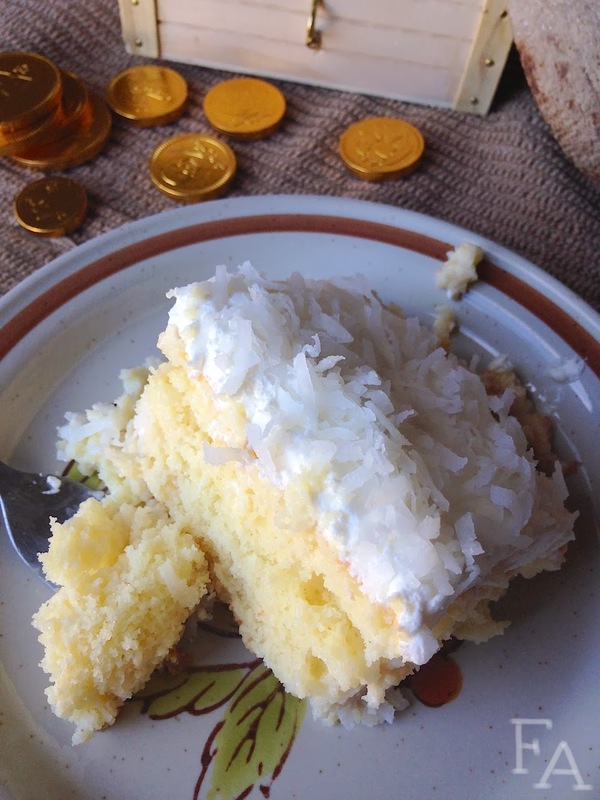 Once the cake is completely cool, spread the top evenly with whipped cream & then top it with a bunch of coconut flakes. To store, cover with plastic wrap & put in the fridge. Very nice after it's had time to chill.